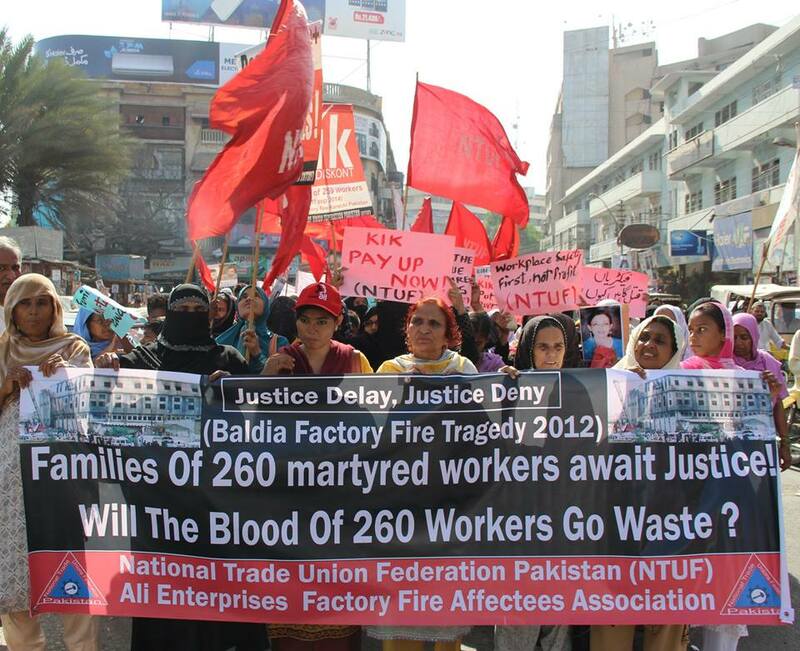 After four years of campaigning and months of negotiations, an agreement has been reached to pay more than US$5 million in compensation to the survivors and families of workers killed in Pakistan’s worst industrial accident. 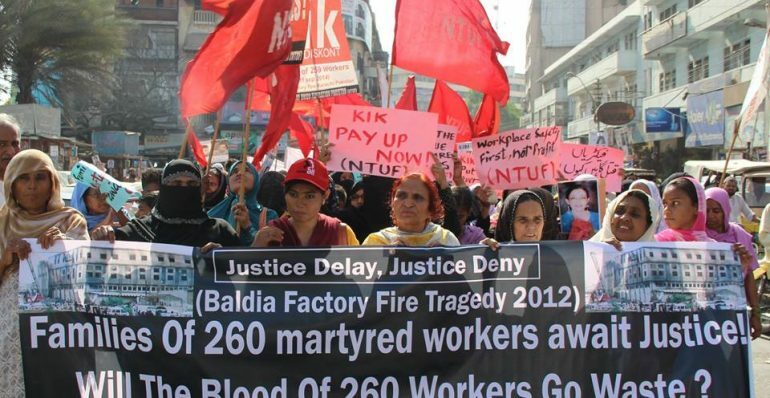 On 11 September 2012, more than 250 workers lost their lives and over 50 were injured in a fire at the Ali Enterprises garment factory in Karachi. Workers burnt to death trapped behind barred windows and locked doors. Others jumped for their lives from the upper floors, sustaining permanent disabilities. German retailer KiK, Ali Enterprises’ only known buyer, has now agreed to pay an additional US$5.15 million to fund loss of earnings, medical and allied care, and rehabilitation costs to the injured survivors and dependents of those killed in the disaster. It is a day of respite for the victims’ families as their cries have been heard. We know that our nearest and dearest will never come back, but we hope that this kind of tragedy will never ever happen again. The government, brands and factory owners must seriously observe labour and safety standards in factories. Saeeda Khatoon, a widow and vice president of Ali Enterprise Factory Fire Affectees Association, who lost her only son in the fire. Previously KiK paid US$1 million to a relief fund. However, it has taken joint campaigning by the National Trade Union Federation (NTUF), PILER, IndustriALL Global Union, to which NTUF is affiliated, Clean Clothes Campaign (represented in the UK by Labour Behind the Label) and other allies including UNI Global Union, to secure proper compensation. The new funding Arrangement follows negotiations facilitated by the International Labour Organization (ILO) between IndustriALL, CCC, and KiK, at the request of the German Federal Ministry of Economic Cooperation and Development. The Arrangement is intended to supplement payments due to victims by public social security schemes in Pakistan to meet compensation levels required by ILO Employment Injury Benefits Convention 121. Additional periodical payments to victims are expected to begin in early 2017. This historic agreement is unprecedented in the context of Pakistan’s labour movement. After four years of struggle the victims of this tragedy get justice and their pain and suffering are acknowledged internationally. We are thankful to IndustriALL and CCC who represented the workers’ case successfully. The ILO has also played a vital role to make this landmark agreement possible. Let it remind us that safety in the workplace is a right, not a privilege. Just weeks before the fatal fire, Ali Enterprises received SA 8000 certification from the auditing firm Social Accountability International, meaning it had purportedly met international standards in nine areas, including health and safety. The ensuing tragedy underlines the failure of social auditing models and raises serious concerns about the standard of safety inspections in Pakistan as well as the implementation of labour laws and building safety codes. The Arrangement is the third in a line of compensation agreements negotiated by the labour movement following large-scale disasters in the garment industry at Tazreen fashions in 2012 and Rana Plaza in 2013, both in Bangladesh. The US$5.15 million to be funded by KiK will include a US$250,000 margin for a fluctuation in costs, meaning that US$4.9 million will go to the affected families and survivors. The implementation, administration and governance of the Arrangement will be developed in a process facilitated by the ILO. It will involve close consultation with relevant constituents and stakeholders, as well as a supervisory role for the Sindh High Court. In total, the Arrangement will provide US$6.6 million for the compensation process, with US$5.9 being provided by KiK and US$700,000 being funded by Sindh Employees Social Security Institution (SESSI). Claimants will be paid a monthly pension. The amount will differ according to the individual’s financial situation and number of dependents. The pensions will be not at living wage levels, as the international standards for workplace injury are based on actual wages earned. In the Ali Enterprises Arrangement however the proxy used for the actual earned wages is generous and pensions are indexed to meet the inflation rate. The Arrangement does not cover damages for pain and suffering.